Once upon a time the Ancient Gods of Outer Darkness came together to look upon the Lands of Dream. Great writhing beasts of chaos they were, monstrous and many-limbed, terrible even to contemplate, and their hearts were filled with loathing. They looked upon the Lands of Dream and hated all that they saw, abhorring the beauty and the majesty of life. “End it! We must end it!” they howled in their titanic voices, and dreamers awoke with screams of terror all across the worlds. “Undo it! Ravish it, destroy it! Twist it from within until it is a mockery of itself! End it!” And all those unfortunate enough to hear their abominable voices echoing in the darkness were driven mad, forever rending at their ears and howling in agony, or slowly degenerated into shambling anomalies of flesh and teeth and bones; and some had their souls overtaken by chaos and became Objectivists. The Ancient Gods of Outer Darkness laughed, and set out to inflict an even greater terror upon the world. It was the creatures of the forest that were to be their first victims, for their beauty was especially hateful to the darkness. Around a beautiful forest in a land inhabited by goblins, then, it was that the gods gathered, their limbs’ convulsions casting strange shadows onto the trees. 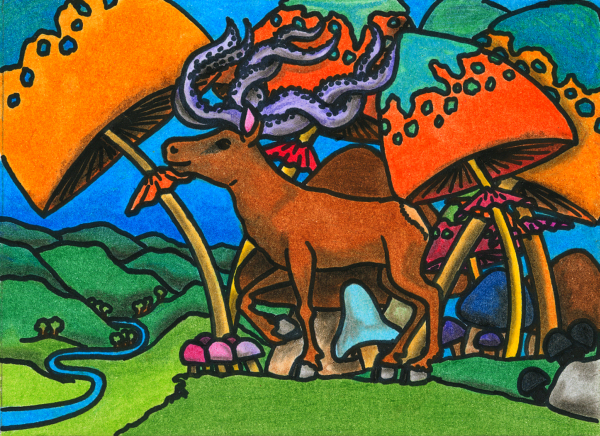 Many of the forest-creatures fled to hide in their burrows and their nests, terrified of these hovering cephalopodan deities; but one brave stag came out of the trees to see what was happening. Now the dark power of the Outer Darkness was unleashed, transforming all before it, twisting and turning and deforming, and trees were made into mushrooms, and bones became tentacles, and the gods roared with nefarious delight as all was enveloped in a mist of unspeakable transmutation. In time, the mist cleared, and the gods descended to observe what they had wrought. A terror came into their souls then, for it was not as they had expected. The stag still stood, and though it had been transformed, it had not lost its beauty or its majesty; and the same was true of the forest, and all that their power had touched. Great cyclopean tears welled up in their terrible, world-devouring eyes, and they did not know whether they wept for their failure, or because what they had created was beautiful to themselves also. “We must… we must crush this! It cannot be allowed to exist,” one of them said. Their hearts full of fearful emotions, the Ancient Gods of Outer Darkness sought out someone to terrify with their voices; but now those who heard them, while frightened, were not driven mad. Some, it appeared, were even inspired, and began writing stories about them. “Are you sure we shouldn’t destroy everything?” said one, writhing half-heartedly. And so it came to pass that the Ancient Gods of Outer Darkness settled down, and became part of the world they had once hated, in which they had accidentally become creators of beauty. They tended the forest and protected all its creatures; and their greatest pride was that most majestic of creatures, the resplendent Stagctopus. This entry in the Oneiropolis Compendium was made possible by Vitor Bosshard, who lives in the Fractal Forest.